One of the first and also greatest ‘gangster’ films to emerge from Hollywood, however the only Academy nomination it received was for the screenplay, based on the novel Beer and Blood. James Cagney plays a dynamic lead, and Jean Harlow plays a small role as a call girl -her only role opposite Cagney in a film. Little Caesar was released at about the same time and was also directed by Wellman. Cagney’s character was based on the real Chicago gangster named Earl “Hymie” Weiss. The film, which glamorized violence and illicit activity, was a significant cause for Hollywood to instill its infamous code that censored unwanted violent or sexual material. Tom Powers and Matt Doyle grow up together, but Tom causes mischief around town to shop owners and kids. He is the son of a policeman who spanks him whenever he makes poor decisions. Tom gets involved with a robbery that goes awry when someone accidentally shoots a stuffed bear, and Tom also shoots a police officer while fleeing the scene. He lays low for a while. While running trucks during the great war -and after in 1920 -Matt and Tom begin bootlegging beer. Tom begins to become cruel and cold-hearted, as evidenced when he breaks up with his girlfriend by shouting her down and shoving a grapefruit in her face. The END of Tom Powers is the end of every hoodlum. ‘The Public Enemy’ is, not a man, nor is it a character — it is a problem that sooner or later WE, the public, must solve. 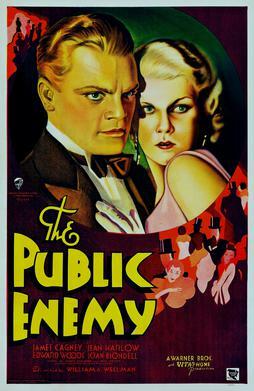 The Public Enemy is a marvelous film that is highly significant to the development of film. It is a great film that should be seen by all classic film lovers, if nothing else than for the tremendous performance by James Cagney.